How do you pick the next stock to invest in? One way would be to spend hours of research browsing through thousands of publicly traded companies. However, an easier way is to look at the stocks that smart money investors are collectively bullish on. Hedge funds and other institutional investors usually invest large amounts of capital and have to conduct due diligence while choosing their next pick. They don’t always get it right, but, on average, their stock picks historically generated strong returns after adjusting for known risk factors. With this in mind, let’s take a look at the recent hedge fund activity surrounding Aramark (NYSE:ARMK). Is Aramark (NYSE:ARMK) a healthy stock for your portfolio? Prominent investors are becoming more confident. The number of long hedge fund bets went up by 4 in recent months. Our calculations also showed that ARMK isn’t among the 30 most popular stocks among hedge funds. ARMK was in 39 hedge funds’ portfolios at the end of December. There were 35 hedge funds in our database with ARMK holdings at the end of the previous quarter. Today there are a multitude of signals stock traders have at their disposal to appraise publicly traded companies. Some of the best signals are hedge fund and insider trading signals. Our experts have shown that, historically, those who follow the top picks of the best investment managers can outperform the S&P 500 by a superb amount (see the details here). Let’s take a look at the fresh hedge fund action encompassing Aramark (NYSE:ARMK). How are hedge funds trading Aramark (NYSE:ARMK)? At Q4’s end, a total of 39 of the hedge funds tracked by Insider Monkey held long positions in this stock, a change of 11% from the second quarter of 2018. 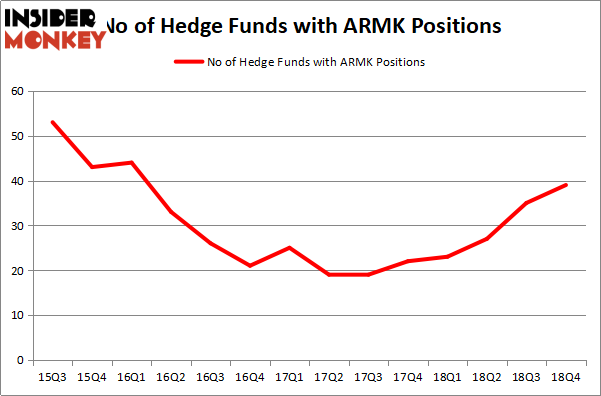 The graph below displays the number of hedge funds with bullish position in ARMK over the last 14 quarters. With hedge funds’ positions undergoing their usual ebb and flow, there exists a select group of key hedge fund managers who were increasing their holdings substantially (or already accumulated large positions). 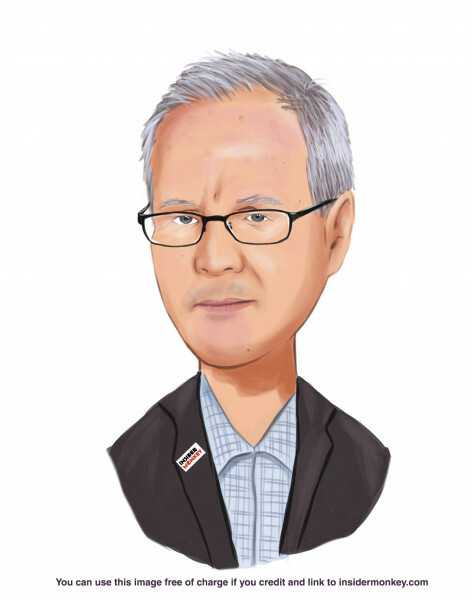 Of the funds tracked by Insider Monkey, Michael Lowenstein’s Kensico Capital has the largest position in Aramark (NYSE:ARMK), worth close to $255 million, amounting to 5.6% of its total 13F portfolio. Sitting at the No. 2 spot is Glenview Capital, led by Larry Robbins, holding a $87.6 million position; the fund has 0.8% of its 13F portfolio invested in the stock. Other peers with similar optimism contain Israel Englander’s Millennium Management, John Overdeck and David Siegel’s Two Sigma Advisors and Seth Rosen’s Nitorum Capital. As one would reasonably expect, key money managers have been driving this bullishness. Atalan Capital, managed by David Thomas, established the most outsized position in Aramark (NYSE:ARMK). Atalan Capital had $34.6 million invested in the company at the end of the quarter. Peter Rathjens, Bruce Clarke and John Campbell’s Arrowstreet Capital also made a $25.9 million investment in the stock during the quarter. The other funds with new positions in the stock are Joel Greenblatt’s Gotham Asset Management, Paul Marshall and Ian Wace’s Marshall Wace LLP, and Jeffrey Ubben’s ValueAct Capital. Let’s also examine hedge fund activity in other stocks similar to Aramark (NYSE:ARMK). We will take a look at Snap Inc. (NYSE:SNAP), Formula One Group (NASDAQ:FWONK), L Brands Inc (NYSE:LB), and Omega Healthcare Investors Inc (NYSE:OHI). This group of stocks’ market valuations resemble ARMK’s market valuation. As you can see these stocks had an average of 24.5 hedge funds with bullish positions and the average amount invested in these stocks was $700 million. That figure was $908 million in ARMK’s case. Formula One Group (NASDAQ:FWONK) is the most popular stock in this table. On the other hand Omega Healthcare Investors Inc (NYSE:OHI) is the least popular one with only 11 bullish hedge fund positions. Compared to these stocks Aramark (NYSE:ARMK) is more popular among hedge funds. Our calculations showed that top 15 most popular stocks among hedge funds returned 19.7% through March 15th and outperformed the S&P 500 ETF (SPY) by 6.6 percentage points. Unfortunately ARMK wasn’t in this group. Hedge funds that bet on ARMK were disappointed as the stock returned 3.5% and underperformed the market. If you are interested in investing in large cap stocks, you should check out the top 15 hedge fund stocks as 13 of these outperformed the market. Were Hedge Funds Right About Dumping Elanco Animal Health Incorporated (ELAN... Were Hedge Funds Right About Souring On Vornado Realty Trust (VNO)? Were Hedge Funds Right About Flocking Into Marvell Technology Group (MRVL)? Is Seagate Technology (STX) A Good Stock To Buy? Hedge Funds Haven’t Been This Bullish On DexCom, Inc. (DXCM) Since 2015... Do Hedge Funds Love Lincoln National Corporation (LNC)?